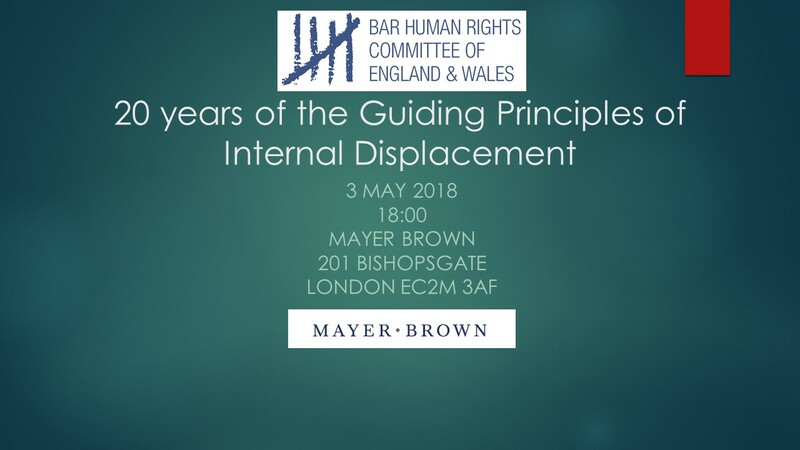 To mark the 20-year anniversary of the adoption of the UN Guiding Principles on Internal Displacement, the Bar Human Rights Committee hosted a panel discussion on internal displacement and international law. The event looked at the IDP crisis in Nigeria and BHRC’s recent training for Nigerian lawyers working with IDPs in North-Eastern Nigeria. The discuss began with remarks from BHRC Chair Kirsty Brimelow QC with a brief overview of the legal status of IDPs and the recent training BHRC conducted for lawyers in Nigeria on the rights and protections of IDPs. Her remarks were followed by a presentation from AB Mahmoud SAN, the president of the Nigerian Bar Association, on the IDP crises in various parts of Nigeria and the work the NBA is doing to assist IDPs. His full slide presentation is available here. The event concluded with remarks from Dr. Chaloka Beyani, the former Special Rapporteur on the human rights of internally displaced persons, on the development of the UN Guiding Principles and his findings from missions during his time as the Special Rapporteur. The event was followed by a reception sponsored by Mayer Brown UK. Chaloka Beyani served as the UN Special Rapporteur on the human rights of internally displaced persons from 2010-2016. He conducted over 40 missions, including official and working visits, and attended dialogue platforms as a voice for internally displaced persons. His last but one missions was to Nigeria and North eastern Nigeria in Maiduguri. He is Associate Professor of international law at the London School of Economics and he has worked and published extensively in the fields of, inter alia: human rights, international criminal law, international humanitarian law, humanitarian assistance, migration, refugees and displaced persons. is a recognized international and United Nations expert on internally displaced persons, population transfers, mercenaries and private military companies, sexual and reproductive health, the human rights based approach to development, climate change, making treaties, and making constitutions. He has served as a legal adviser and expert to the Office of the High Commissioner for Human Rights, the Office of the High Commissioner on Refugees, the World Health Organization, the United Nations Population Fund, United Nations Development Fund for Women, the European Union, the Commonwealth Secretariat, and the African Union. In addition, Dr. Beyani has drafted and negotiated a number of important international instruments including the International Conference on the Great Lakes Region, and the African Union Convention on Internally Displaced Persons. He was a member of the Committee of Experts that drafted and negotiated the Constitution of Kenya 2010. He is a member of the technical mediation team to the peace process in Mozambique in his most recent engagement. You can read his end of mission statement here. You can also view his remarks on Women, Peace and Security here. 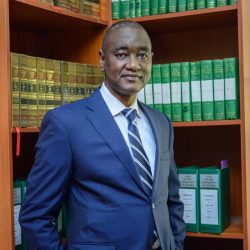 Abubakar Balarabe Mahmoud is the 27th President of the Nigerian Bar Association (NBA), the umbrella professional association of lawyers in Nigeria. Mr. Mahmoud was elevated to the rank of Senior Advocate of Nigeria (SAN) in 2001 and is a Life Bencher on the Body of Benchers, the regulatory body comprising of the most senior members of the legal profession in Nigeria. He has also received the national honour of the Officer of the Order of the Niger (OON). Mr. Mahmoud was one time Attorney-General and Commissioner for Justice of Kano State and had previously served in the Kano State Ministry of Justice, where he held various positions as prosecutor and legal adviser in the Ministry including; Director of Litigation, Public Prosecution, and Solicitor-General from 1979 to 1993 Mr. Mahmoud is the Managing Partner and one of the founding partners of the law firm of ‘Dikko and Mahmoud’. He is a member of the International Chamber of Commerce (ICC), the London Court of International Arbitration (LCIA), and was recognised in the Energy Arbitrators List (EAL) in 2013. Mr. Mahmoud studied and obtained a Bachelor’s degree in Law from Ahmadu Bello University, Zaria in 1979. He holds a Master’s degree in Law from the same University. He has attended several courses at various global institutes, notably the International Development Law Institute (IDLI) now IDLO in Rome, Italy, where he obtained a Certificate in Law and Development in 1987 and Harvard University where he obtained a Certificate in Techniques of Privatization from the Harvard Institute of International Development in 2000. He also attended the North-Western University School of Law Summer Institute in Corporate Law and Business in 2001.